Health House offers the most comprehensive Live Cell Microscopy training course worldwide. Our course offers 4 full days of hands on training, in a fully equipped facility, taught by certified trainers and teaches you everything needed to incorporate Live Cell Microscopy into your practice. The course is available to students and certified health practitioners. Why Learn Live Cell Microscopy? Many nutritionists, naturopaths and other holistic health professionals use Live Cell Microscopy as a tool for assessing the state of one’s overall health. Live Blood Cell Microscopy is an assessment tool where a drop of blood from a patient's finger is placed on a microscope slide and viewed under a darkfield microscope at a magnification of over 1,000 times. The image is then displayed on a television monitor, and is visible to both the practitioner and patient, showing over 50 aspects of one’s state of health. Examining live blood allows practitioners to see vitamin and mineral levels, toxicity, levels of dehydration, PH balance, allergic reactions, parasites and a host of other conditions. From there an accurate dietary and supplementary plan can be created to aid the individual in restoring their system to an optimal state of health. 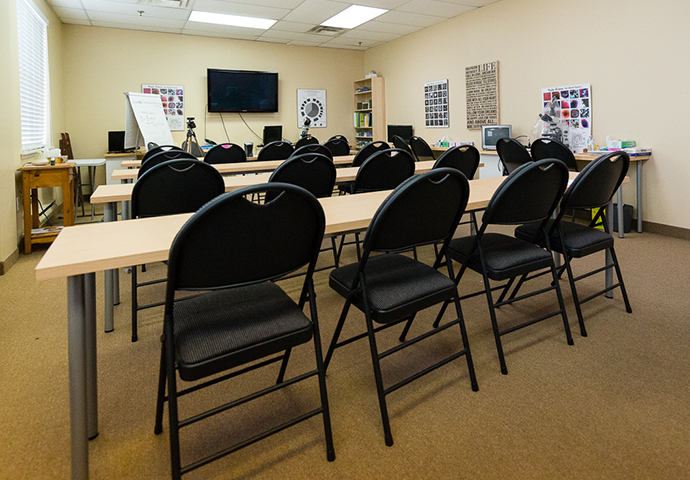 All Live Cell Microscopy Courses take place at our training facility located in Markham, Ontario. Our facilities are fully equipped with full workstations, to allow all students to have practical, hands on experience with all aspects of live cell microscopy. Lynne Hinton BSc, BEd, ROHP, CHCP is a Registered Orthomolecular Holistic Practitioner and a certified microscopy trainer (having trained under Michael Coyle). She has extensive experience offering microscopy training courses internationally and has for the past seventeen years used microscopy as a client assessment tool in her thriving clinical practice in Markham, Ontario. As a lecturer, instructor, author and trainer in microscopy and nutrition, Lynne has a wealth of knowledge to share with practitioners. ND’s, ROHP’s, MD’s and DHom’s who are practicing Microscopy, assist in the Live Cell training offered through Health House. You have seen the Live Blood Cell Analysis (LBCA) at a trade show, read some articles, appreciate the value of this tool in clinical practice and you are now keen to choose a course and get some equipment. An internet search turns up some organizations that offer the training and now the confusion begins. Depending on who you talk to, you will hear differing opinions. As a practitioner using the Live Cell Microscopy in my nutritional consulting practice for 16 years, I would like to clarify how to make an educated decision that maximizes the amount of money that you are about to spend. It can be a very costly decision if the wrong choices are made. There can be great disparity between one school of thought over another. There is classic hematology, usually done on a Phase Contrast system & there is Enderlein theory & Sanums, always done on a Darkfield system because that's the best way to study the bacterial phases of the endobiont. My initial training was what I call “popular” microscopy, completed in Arizona 16 years ago. It was Phase Contrast, no Enderlein theory or Sanums. Their primary use of the live blood was to sell nutritional products. i.e. here's the condition, here's the product to target it. Anyone could do the training. This is a potentially dangerous situation for researchers as well as those who are looking for progressive health services. It puts microscopy in a bad light as these services come under government scrutiny. There are also individuals and companies who train people to identify the blood conditions based only on hematology - it's a more allopathic approach that palliates the symptoms rather than focusing on the terrain & eliminating the underlying causes. Although useful as an introduction to the blood conditions, it is not the best approach to practise this way. One course I attended many years ago with a Hematologist was excellent information on pleomorphism and mycoplasma. These are chemically induced, mutated bacterial forms. When I inquired about what was recommended to clean up the mycoplasma, the answer was to take antibiotics, the very chemicals that created the problem in the first place! Some of the courses teach good dietary and nutritional principles and promote other assessment equipment or a particular product line. Unfortunately, with serious disease, this is not enough to address the pleomorphic cycle & clean up Cell Wall Deficient organisms (Haptens do this very well). The additional equipment or product that is being promoted is very expensive. The focus is no longer on a thorough microscopy training using Enderlein principles and protocols. It is a “bate and switch” technique using the microscope to get you in to look at other equipment/products being sold. Why Darkfield over Phase Contrast? I often hear from unhappy individuals who are suffering the consequences of buying expensive, but inadequate equipment. Beware of courses that sell the equipment and include the training as a package. Often there are errors in technical understanding associated with the training that accompanies the equipment promotion. An excellent Darkfield microscope system with video camera will cost $7,000. - $8,000. Used equipment is also available for $4500. to $6000. The best Darkfield employs a mirror condenser of special design, the Cardiod Condensor. This condenser uses special mirrors that form a hollow cone of light with its focal point in the plane of the specimen. The specimen is therefore illuminated by peripheral light. The background is black as the direct light from the condenser passes around and not through the objective. This gives the enormous contrast, as we see only the jet black background and brilliant white light from the specimen. These systems produce true high illumination with a 150 watt halogen light source and oil immersion. Phase Contrast is an illumination system designed on the principle of light retardation and phase absorption. A special condenser and objectives are required and a setting of specific phase “plates” for each objective used. The image produced appears in various shades of grey/blue, with the background being lighter than the specimen (the opposite of Darkfield). My first microscope was a Phase Contrast system. After training with the late Michael Coyle in Darkfield, I ended up needing to replace this a few years later, a very costly venture. Darkfield is particularly superior and valuable in searching for the detailed examination of the smallest particles such as the advanced phase of the life cycle of the colloidal microorgansims which are at the very deepest level of the causes of blood imbalance. Darkfield creates a tremendous contrast which increases the definition and resolution to a degree that is simply not possible with Phase Contrast. 3. This is a test that is done by allowing blood drops to dry on a slide. This technique began with Dr. Goldberger and then Dr. Bolen in the US in 1942. It was called the Sedimentation or Bolen Blood Test. Doctors Henri Heitan and LaGarde continued use of the “Color Microphotographic Test”. Bradford later published the rationale for this test in 1981. A complete LBCA course should include the theory behind this practice. It is a very useful tool to accompany the Darkfield analysis of the blood. 1. Is Enderlein theory and Sanum therapy taught in the course? 2. Do you teach Phase Contrast or Darkfield? 3. Is the Oxidative Stress Test taught? 4. Can you give me references so I can speak to students who completed your training? 5. How much time is spent on actual microscopes? How many students per scope? 6. What teaching experience do the course instructor(s) have? Darkfield or Phase Contrast, Which is Best? Micro Serve-Peter Bittner 416 250-9250.